Ian Gillan and Tony Iommi have donated 4 Takamine acoustic guitars and a Gretsch drum kit with Paiste cymbals to a musical school in Gyumri, Armenia. The town of Gyumri was devastated during the 1988 earthquake. Last October Gillan and Iommi have visited the school, which is still housed in temporary shelters. Gillan’s solo concerts with the State Philharmonic Orchestra of Armenia will take place in Yerevan on March 26th and 27th. The entire proceeds from both shows will be directed to rebuilding of the musical school in Gyumri. Thanks to Blabbermouth and Panorama.am for the info. Posted by Nick Soveiko on Tuesday, February 16th, 2010, filed under News. You can follow comment on this post through the RSS 2.0 feed. You can leave a comment below, or trackback from your own site. kudos to both gentleman. some see the gillan black sabbath album so-so. the more i listened to it the more i liked it. plus, IG inserted some good stories from his time with B/S. Why would Gillan have a problem talking to Iommi? I would love to hear another Gillan/Iommi cd; this time with Roger Glover on it! Awesome cd that would be!! 5 stars! Gillan is a great personality !! an exampel ! 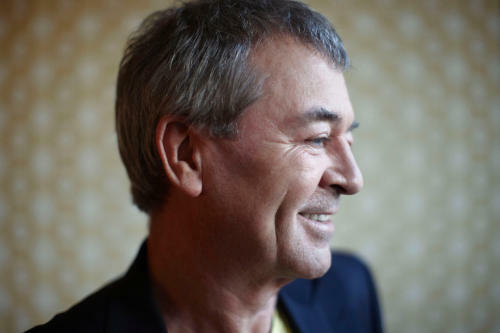 2 On the other hand…..I just heard that Gillan after The Born Again Tour which did not went so well I ve been told NOT did get paid. I saw them at the Sunrise Theater in FT. Lauderdale, Florida and was totally blown away. Nightranger opened for them. Not too shabby an opening act. They were great I thought, until Sabbath walked on the stage and kicked them all to hell and back. I’ve seen all the Sabbath line-ups and have to state here, that with out a doubt, the Gillan version was tops. His renditions of the other stuff, such as Heaven and Hell, Black Sabbath, Neon Knights, War Pigs……INCREDIBLE!!!! There were some Amazing Gillan Screams on the record and the your. The problem with him doing a follow-up and touring it would be all the criticism he would get from the narrow-minded complainers whining about him not being able to do it exactly as before….. Personally I would love to see and hear it, but ‘don’t hold your breath’. @9 Roberto: yeah, it’s a great bootleg, also known as Born in Hell I think. I listen to it every now and then, and it really was an amazing performance from IG, from the whole band actually. @10 Never saw the Gillan lineup myself but have always liked Born Again, as well as Seventh Star with Hughes, both underrated gems in my book! Is there really no possibility of a BORN AGAIN live cd ? Priest, there are tons of Boots out there. Some pretty good, most terrible regarding sound quality. I don’t see an official release of anything in the near future due to Heaven and Hell being the Sabbath focus as of now, and of course the Osbournes…(Sharon) having the main rights to the name at this time. It’s a shame Gillan didn’t have more leverage in the name at the time so he could have something released as was done on the Angel Air label, as with so many other Gillan performances from back in the day. I think I registered there way back, Tracy. But right now I do not remember exactly my inlog data. I DO seem to remember that Larry runs the place over there? I forgot if one has to pay a certain something for being able to download. Is your recording good quality? I cant stand low quality recordings. Worcester I have on cd and is kinda cool to listen to. I also think I have Reading 83 somewhere, not sure…..strange enough. People always stress the differences between people. Besides “the rest” that is that I am ALSO audible on bootleg. Live in Rotterdam 1981 and OTR in Uden 2009. Nothing special but luckily not that of that drunken kind of an old friend of mine who got completely wasted in 81. Its possible I can be heard on more than those 2. The fact is that I try to be in front of the stage and sometimes I cant help myself shouting a certain request. So, Whitesnake live in Zwolle 2003 just before Aint Gonna Cry No More, is another option I d like to hear. Aint Gonna Cry No More Today….. I ain’t gonna walk you through it again…. It’s there. In all it’s glory. I did it. I recorded it. It’s pretty damn good for it’s day and compared to the rest of the Boots. Whole show. Nothing missing…. for one whom ain’t goon cry no more, you sure do whine alot…. Maestro L da Vinci wouldn´t or couldn´t invent a better couple. And for a complete line-up: Y Malmsteen on bass( no kidding), Johansson Bros on drums&keybords. Yes I am from Sweden. For now I prefer the Born Again DEMO takes incl the bonustrack Falling but , apart from the bad parts also there, Gillan was screaming and singing like the devil on more than one Black Sabbath song as well. Glad I witnessed that strange chapter live as well. I know Gillan was not the skinniest man around but a DVD of a show would have been grand as well. I do know close to nothing about Edgar Winter, unfortunately. Tried to step into that territory once but somehow I did not get started. The only detail connected with the Purps must be the suggested connection on the track TOBACCO ROAD, I think. It did concern the example for Ian Gillan to implement the screaming part as his trademark, so I read. TO ME it was less impressive evidence than expected and hoped for. The dressing in white or cream for that matter somehow reminds me of a shot a friend of mine took at the gig in Zwolle. The picture was taken from afar but very good. Maybe my film did run out at the and of the show and the white or cream clothes came in for the encores of Paranoid and SOTW? I guess you implied that his long hair got cut, not during the Sabs days btw but in the beginning of the reuniondays with DP,because of the hard work Ian did in Sabbath? I ve understood by now that UP TILL TODAY, we are suffering the consequenses of his choice in that period NOT to rest but soldier on. I suppose it had to do with MONEY adn at the same time would prove that he did NOT lie towards the GILLAN members and was broke himself? After several decades of financial problems he finally got a sense of it all and chose to be very RATIONAL in a buisness sense in 1993 when joining DP again. Very understandable but I feel that he could have had both sides of the opportunities. Not touring excessively because , I read they make EACH 30.000 E a person a night……which I find very much to be quite honest, he could have made lots of money and at the same time stay closer to his integrity values IMO. Now he lost too much of his voice and in a musical sense wasted 16 years with the WRONG MAN. I m so frustrated about things like this. Well, time for solace, I ll soon be listening to Jons new album. An album that WILL stand the test of time. Yeah, Priest leaving Sabbath for Purple was allright from a money stand point it had to be substantial. Not clear on your point about the 30000 a night. Was it with the Sabs or the Perfect Stranger Tour that we are talking the 30K a night? Find it hard to believe Ian lost so much money with all the Radio Royalties, his business manager must have been a MORON. Loved Ian on Perfect Strangers but would have loved to hear one last Sabbath Studio Album just the same. As for the present Purple yeah Steve Morse is OK in the studio but we may never see the likes of Made in Japan in our universe let alone this solar system. Maybe Satriani or somebody like Rory Gallagher with a healthy liver? Then who knows we might be having a different conversation and drinking champagne instead of sipping tap water. Finally, this last thing on Edgar Winter somewhere between 70 and 73 there was some incredible live recordings on King Biscuit or one of the other Radio stuff of that era. Edgar matches the guitar to the vocals note for note just like Ian but not to be outdone while playing the keyboard also matches that note for note. Opened for Purple out here at Pacific last year. THEY ARE ALL IN THE 60 year old range…..For F..Ks Sake!!!!! Of course they will never do another Made in Japan….All Live Recordings are a Once in a Life time thing….good or bad. Plus, the quality and enjoyment is to each individual. For the complainers of the lack of MIJ repeats….that was in 1972. Blackmore and Co. had 21 years to do it again. It Didn’t Happen apparently. Get over it. Plus, I have seen many performances that stand up to that concert. That particular one was recorded and officially put out by the record Company at the RIGHT TIME. As with All Hits. Timing is everything. All is INCREDIBLE. ‘Love is All’. You ofcourse forget the immense peaks they scaled during the Battle Rages On Tour? It is not your fault they did not tour the States way back but maybe it would have coloured your judgment less negative if they had? On the other hand, ,maybe you told Roger that you went to the bar during long improvisational pieces, perhaps it rubbed off wrong? “Pearls for swines”, still have to hunt that album down. I love the Hieronymus Bosch art!!!! Can somebody sent me a poster, please???? Priest, I have many recordings of the BRO tour. Yes, there are some Great performances. Throughout Purple History. I actually made my state opposite to what you are eluding to. The MIJ album is way overrated as far as I’m concerned. I stated before that I have seen many performances from Purple since that excited me much more so. The fact that MIJ is the Staple for them is as I stated prior Also. Just as SOTW became their Anthem. Right place, Right Time. MIJ was a good performance that got recorded officially and because Purple is such an awesome band LIVE (still today), it was a No Brainer that at that time, it would take off. There were many shows equal to or better than the MIJ show, but that one was the one chosen for LP and it easily could have been any other date around that time. My point is that it got all the attention because it was the one that was distributed to the masses and the rest is history. To state that no other Purple gig matched MIJ is ludicrous. Every line-up has had it’s MIJ performance. It’s just a different time now and the Hit situation is all different now…. What were we talking about again on this thread? I do NOT see Gillan as an instrumentalist. Yes, I know he does fiddle a bit for demosakes. Why are we talking about MIJ again? Have to scroll back for a moment. Give me one while you re soaking in your tub, please. Ok, it was Black Sparrow who brought up MIJ. And YOU got onto your horse with fury. I KNOW there have been very good or maybe even better recordings around that era. I cant really compare MIJ with other gigs, partly due to the fact that MIJ is professionally recorded. But they DID record those 3 nights and not one of those others!!!! And I sure wish they would have had the brains to realise that they should have filmed it as well and on top of that record EVERYTHING as professional before and after that!!!! Btw, I suppose you ll understand by now that I ll have to disagree and shake my head with contempt hearing you say EVERY mark had their MIJ!!!! Ok, you got with your closing statement…. I can’t include the JLT period in this. So, you are correct. Every Mk but MK5….he he he…..